Why are there rich and poor countries? A common question, with no obvious answer. From the perspective of economic theory, in its different versions, all countries are presented as if, in themselves, they had the possibility of attaining the same benefits in international economic competition. In these discussions, it is interesting to see how certain modes of reasoning as regards the problems of international competition, in the framework of a deeply anti-Marxist tradition, are later appropriated by many self-proclaimed Marxists, who, starting from a leftist discourse, end up reproducing the foundations of liberal ideology. 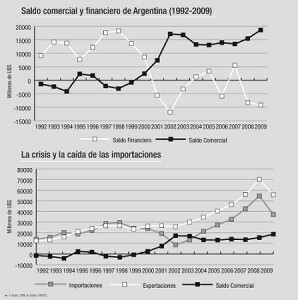 The idea that the problem in Argentina is rooted in the “financial drainage” and the “usurious foreign debt” ends up in alliance with the proposition that the trading of commodities offers equal possibilities for all and, therefore, the differences between countries can emerge only outside economic relations or as violations to their normal development. The key to the problems of capitalism in Argentina are the disadvantages it has in the world market, its tendency to recurrent crises, its indebtedness and its, not very encouraging, perspectives. Argentina is far from being the most productive country in the world. As we have been showing in numerous previous editions of El Aromo, in general, industrial activities which are not of the agrarian type, except for a few exceptions , do not reach a competitive productivity at world scale. The restrictions of a small scale which is offered by the Argentinean domestic market, added to the larger labor costs than those of eastern Asia or in some branches including those of Brazil, are elements which have inhibited the development of competitive capitals in international terms. In spite of this condition, a great variety of economic activities were developed in the country. Here there is a specific element of the Argentine economy which shows itself, which is the importance of income coming from the export of agricultural commodities which are carriers of ground rent, due to its capacity to finance other activities. Agricultural ground rent served historically as a compensating element (through different methods of appropriation) which permitted the survival of local capitals with a lower productivity to that of the world’s mean. However, the expansion of ground rent has a limit and a lesser and lesser weight in the national economy . The capacity of ground rent to sustain a multiplicity of activities which develop in the country under the conditions of a lower competitiveness to that of the world’s mean has been contracting in an important way since the 60’s decade. As a consequence, this prompted, particularly since the mid 70’s, the resort to other sources of compensatory income: the fall in wages and external debt. Even though, during the last three decades there have been constant reductions in labor costs, all the violence implemented by the last military dictatorship and the subsequent governments were not even sufficient to compete with the labor costs which operate in Asia. This then closes off the possibility of competing through labor costs for capital in Argentina. Therefore, external indebtedness has been gaining ground as a transitory source of income. If we take as reference the years previous to the crisis of 2001, in the 90’s, such indebtedness, momentarily, signified a positive net income. Argentina borrowed and at the time of paying back it was able to get refinancing plans that allowed it to cover the payments. The result in practice was that it was being lent more than it was giving back. This, which in the beginning allowed for the financing of the ‘1 to 1’ celebrations, ended up feeding a bubble which did not take long in exploding. As soon as contractions in international credit were beginning to register, insolvent debtors such as Argentina were ‘off-side’ and an increasingly important capital flight began to break out. In response to this, the De la Rúa government announced the famous “shield” with drums and cymbals, which was something of a blank checkbook in Argentina’s power which would allows us to shore up the situation. Nevertheless, the loans of the IMF were not even enough to compensate the flight of capital. Neither the cuts, nor any of the measures taken afterwards were able to prevent the inevitable: the IMF let loose the government’s hands and stopped making disbursements. With the crisis, the mechanisms were turned upside down, with net income due to external financing now cut off this made it necessary to increase the trade surplus to compensate for capital flight (see graph 1). That is to say that in the 90’s, with Menem, De la Rúa (and the omnipresent Cavallo) Argentina received money, while with the duplet Kirchner-Fernández de Kirchner, more went out than what came in. Now then, how did Argentina manage to increase its trade surplus, finance the flight of capital, and “honor its debts”? Could it be that the historical barriers were finally overcome and that Argentina’s industry started to gain ground in the world market? The answer is no. The form in which such surplus was attained was, fundamentally, through an abrupt contraction of imports. For a market which is for the most part composed of imported products, this implied nothing other than a contraction in the local market. In short, it was the time to fasten the belts and buy less. In 2002, with the devaluation of the peso, a breach of positive sign showed up in the trade balance. This was not due to an increase in exports, which during that year only reached 0.02% more than in 1998, but due to the great fall in imports, which contracted more than 70% in relation to the same year. Since then, exports and imports increased proportionally and the trade balance stayed relatively stagnant, presenting a minor fall between 2007 and 2008. During 2009, the trade balance showed signs of recovery again. Could this then be because of a rise in competitiveness during the last years? Again, no. Not only did exports not grow, but they fell by 14 billion dollars. But, and here is the key, imports fell even more: 17 billion. Why does the Argentine economy have to resort to contractions in its local market in order to move forward? It could be argued that these contractions are part of a continuous and neutral motion without further implications. Economic theory abounds in this sort of mechanisms to justify the idea that everything tends to an equilibrium state where nobody loses. However, this possibility does not explain why crisis after crisis, Argentina ends up in a more and more marginal position in the world market. The historical evolution of international trade shows us that in the world market there are winners and losers and that Argentina is clearly in the latter group. In 2008, the whole of Argentinean exports represented only 0.36% of the world market. That is, during the years of Kirchner industrialism, there were no gains for Argentina’s position in the world market, and because of this Argentinean exports represent today similar values to the last decade (which were around 0.4%). Could it be that Argentina’s backward movement is a consequence of the supposed “deindustrialization” caused by the neoliberal policies of the last decades? The figures show us a tendency to a loss in its position in the world market, which is a result of a tendency which goes back, at least, to the second government of Perón (when Argentinean exports represented 2.8% of the world’s total). This tendency cuts through the whole period of the so-called industrialization by imports substitution (ISI) in which a lot of authors maintain, wrongly, that the country’s trajectory was different to the present one. So then, why did the Argentine economy tend to move back during the “industrialist” governments as much as during the “neoliberal” ones? The first thing we have to understand is that Argentine capitalists do not compete only against each other. Be it to gain ground in the international market or survive in the local one, local capitals have to enter in open competition with capitalists of all countries. In other words, the possibilities of local capitals do not depend exclusively on their actions, but on what happens in the world market as a whole. The evolution of the world market as a whole shows us a series of very important issues. On one hand, the gap which Argentina experienced during the last six decades was part of a more general backward movement that affected the whole of Latin America. Since 1948, the total exports of South and Central America represented 12.3% of the world’s total. Today, this figure is reduced to only 3.5%. Within this process, the great economy of the continent, Brazil, was no exception, in spite of the constant apology for its performance made by bourgeois Argentine politicians. During the last 60 years, its participation was reduced by almost a half, going from 2% to 1.2%. An interesting fact here is the similar course followed by the African economies whose participation has reduced from a 7.9% in 1948 to only 2.9% today. As a whole, the gap which separated South and Central America from Africa from a 4% to only 0.6%. On the other hand, this general backward movement of Latin American countries is not explained but for the fact that they have been displaced by capitalists from other regions. Firstly, by the expansion of European exports during the 50’s and 60’s. In turn, an important increase in the participation of Asian exports took place since the 70’s, which, between 1973 and 2005, went from 15% to 27.4%. International trade has registered an important increase since the end of WW2. Since then, the record shows a smaller and smaller weight for primary products. That is, even though trade in raw materials has increased, it did it at a slower rate than that of manufactures. If we take the last thirty years as reference, world trade in commodities of agrarian origin has quadrupled, trade in energy and mining products has sextupled, while trade in manufactures has increased tenfold . The sustained development of productive forces on a world scale has permitted the simplification of productive processes, which allowed capitals to migrate to countries where although qualifications are lower and transport costs larger, the extremely low wages offer better conditions for higher profitability. This allowed for the rapid growth of these countries, the majority located in Asia, and concomitantly the relegation of countries whose foreign trade is fundamentally based on primary products . Within this group, there is a marked worsening for countries specialized in agrarian products. In this general framework, the great loser has been the United States, whose participation in total exports has reduced from 30% to almost a half of that, which reflects the difficulties of the capitals which are located there to keep themselves competitive. During the last decades, a lot of the processes which used to be carried out there have migrated to Asia in search of lower labor costs. This process went hand in hand with an increasing trade deficit of the economy and an abnormal growth of its indebtedness. The perspectives ahead, for Latin American economies, particularly the Argentinean one, do not look very encouraging. This is not because of distortions to the free market (as the liberal position would argue), nor the perverse action of the world of finance. It is in the production and circulation of commodities where the existent inequalities between countries stem from. Industrial production in Argentina was and still is less productive than the world’s mean and it does not have low enough labor costs to compensate for that. This places it in clear disadvantage to compete with the low production costs in Asia. This is not a question restricted to the national realm, but it affects the whole of Latin American countries and even the largest economy in the world: the United States. In Argentina, the sectors which rely on absolute advantages are linked to agricultural production. Agricultural exports are still the only support of the national economy. Nevertheless, the capacity of ground rent to sustain the local market is limited, while the agrarian sector keeps being reduced to a smaller and smaller presence. For example, Siderca, which relied on particular conditions due to the market if oil inputs which were not reproducible in other branches, was able to reach the mean competitiveness in the production of drill pipes. See: Kornblihtt, Juan: Crítica del marxismo liberal, Ediciones ryr, Buenos Aires, 2008, chapter 4. Iñigo Carrera, Juan: La formación económica de la sociedad argentina y sus crisis, vol. 1, Renta agraria, ganancia industrial y deuda externa. 1882-2004, Buenos Aires, Imago Mundi, 2007. See in this number the note by Bruno Magro on the evolution of textiles production and the competition between countries of eastern Asia in the supply of lower labor costs. advantage, argentina, capitalism, economy, industry, trade. Marcar.